One of my goals for 2014 (Find all of my goals here) is to celebrate the smaller holidays more. 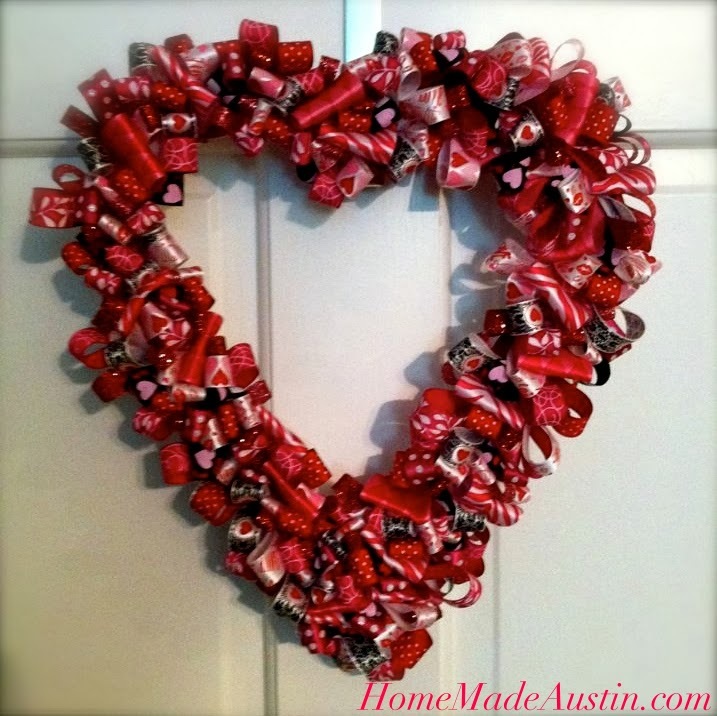 Valentine's Day is about a month away, which means it's time to start getting some decorations ready! 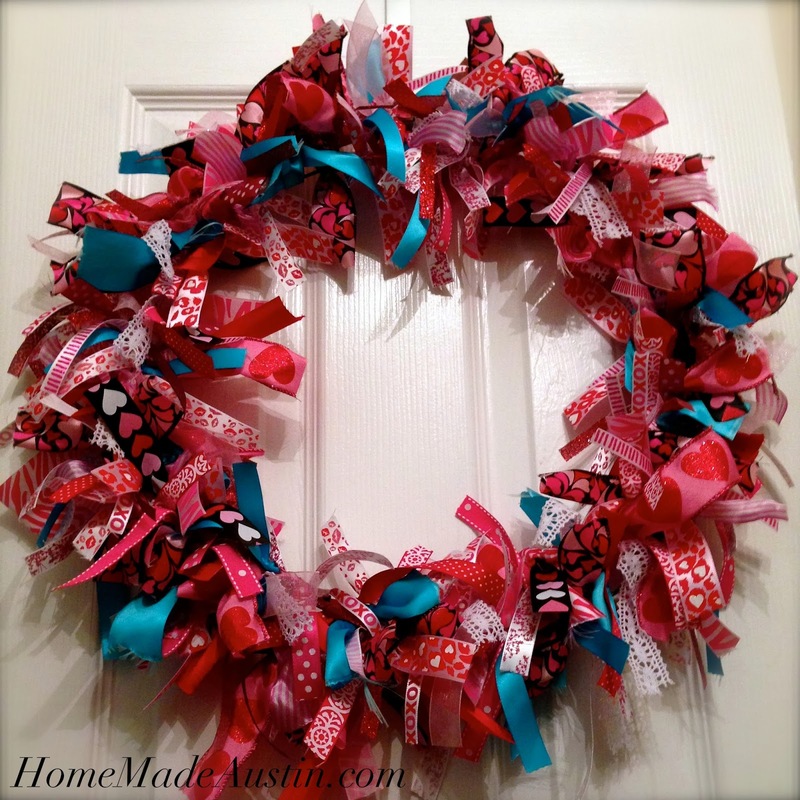 A couple of years ago, I made a fun ribbon Valentine's Day wreath for my sister's classroom. I loved the outcome, but it was very labor-intensive. Each loop had to be individually secured onto the wreath with a stick pin. 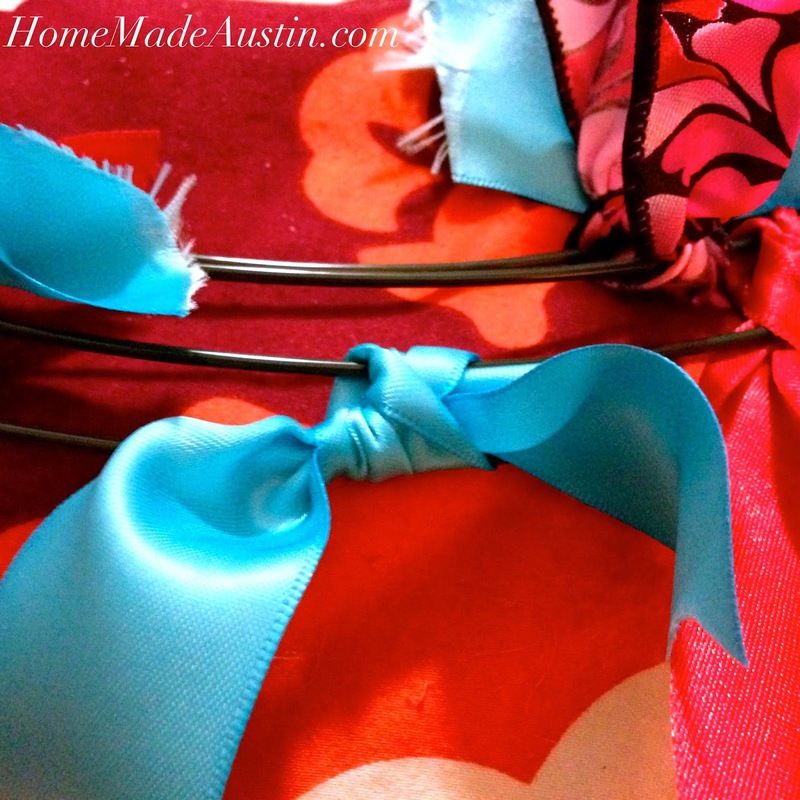 By the time I was finished, my fingertips were sore & I was tired of seeing ribbon loops. Well, I had several half-spools of ribbon left over from that wreath & wanted to make a similar wreath for our door, but was not interested in spending hours & hours working one a single project. 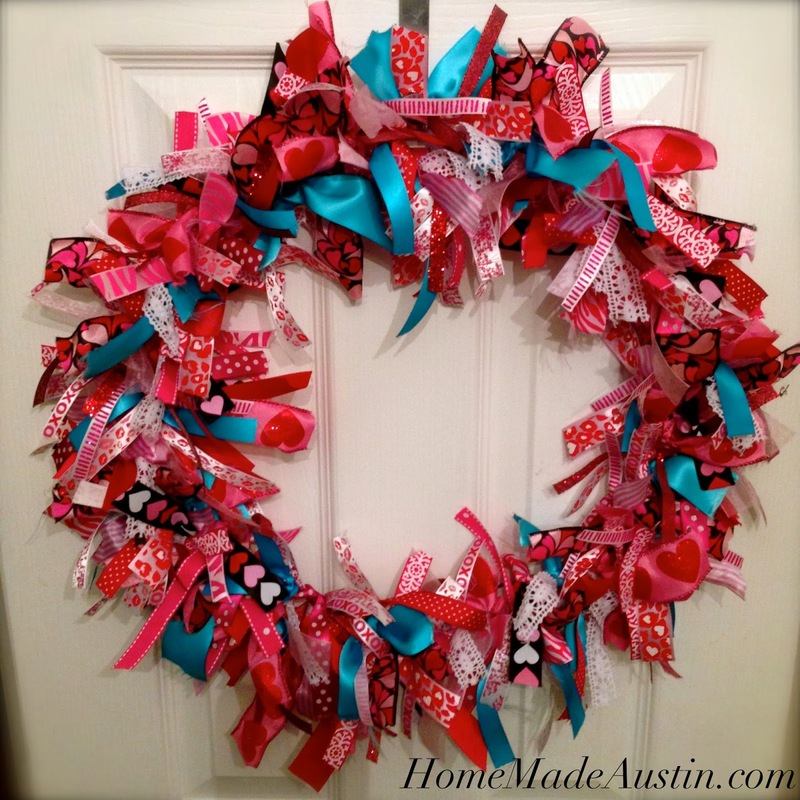 So, I thought of using a wire wreath form & tying pieces of ribbon instead. It would give me the look I was wanting & let me use all the different patterns & colors I wanted to incorporate. The result was really simple to do & came to together quickly....no sore fingertips either! 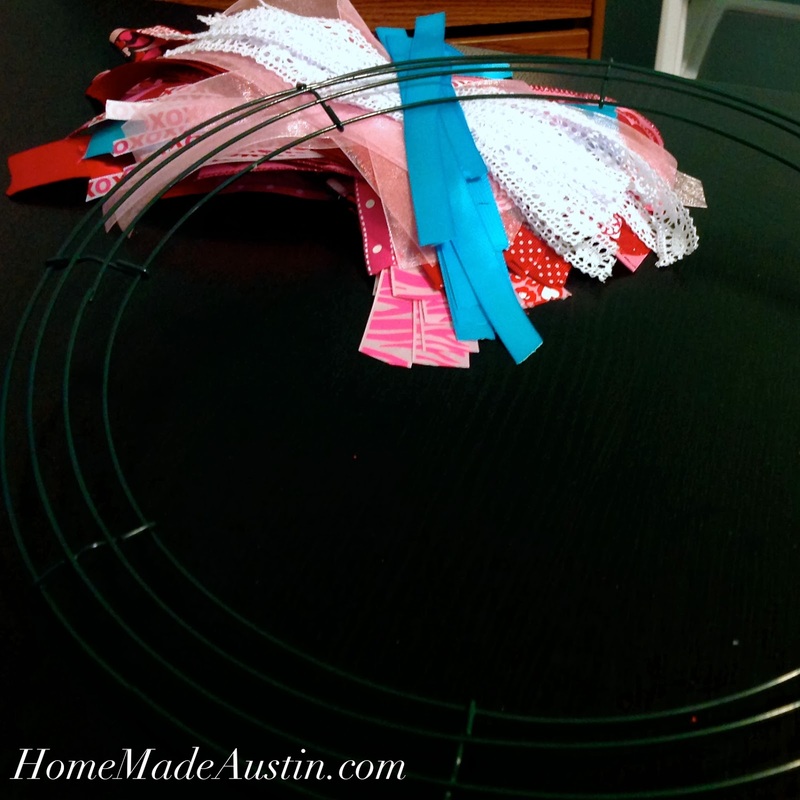 I started with a medium-sized wire wreath form from Hobby Lobby & about 200 ribbon pieces, each about 4 inches or so. I really didn't worry about the length of the ribbon much while I was cutting; mixing up the lengths a bit helps keep the final look interesting, not uniform. I had several types of ribbon in my stash, so I didn't buy any new for this project, but I know Michaels usually has a ton of cute holidays ribbons & if you watch, they should go on sale soon. Then, while watching a movie, I just tied each piece onto the form in a random pattern. 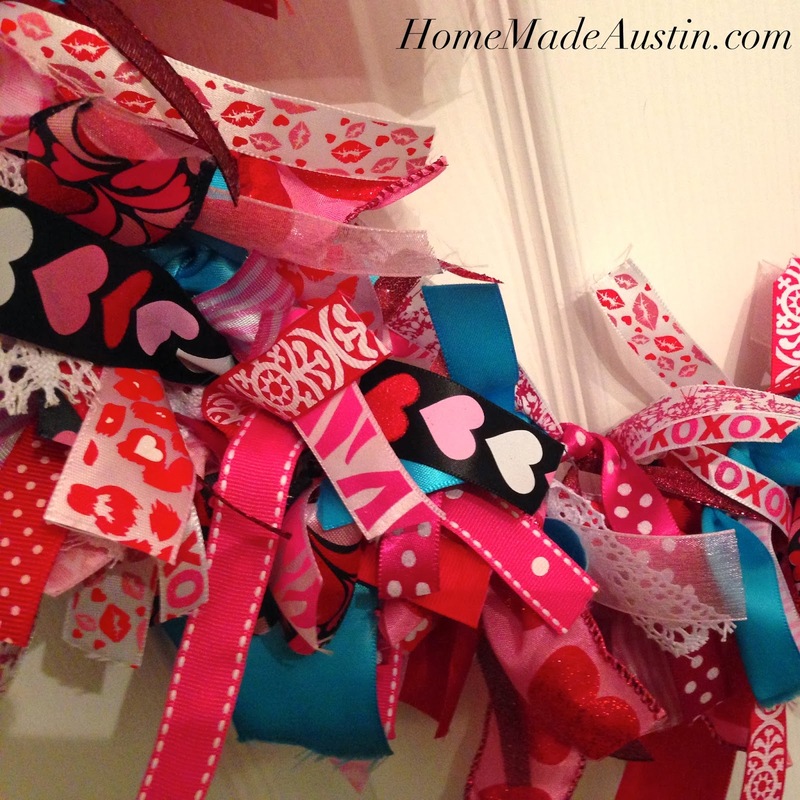 I took each pattern of ribbon & tied all of those pieces onto the form before starting with another pattern. I think it makes it easier to figure out where to put each piece, but it's totally up to you how you tie the ribbons on. After I tying all of the ribbon pieces on, the wreath was pretty flattened, so I hung the wreath on the hanger & then spent a few minutes fluffing & pulling the ribbons to make them look full & pretty. Simple to make, but really cute & fun. Happy Valentine's Day!